I’ve often crossed the Atchafalaya Basin and Lake Pontchartrain to meet favorite authors at Garden District Book Shop in New Orleans. It’s where I first met Sonny Brewer a decade or so ago when he signed my copy of his novel, The Poet of Tolstoy Park. I’ve been pestering him ever since. So he joined Deirdre Gogarty and me for our Pugilism & Prose book event there. And he brought his guitar. 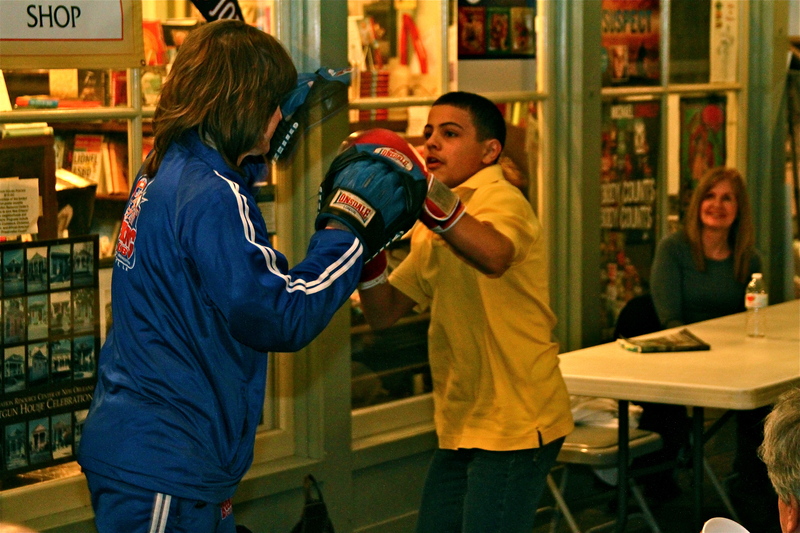 As promised, Deirdre worked mitts with two young boxers. Award-winning author, Tom Piazza, dropped by. And so did French-born Crime Fiction author and former boxer, Ro Cuzon. Dee and I were thrilled they made it. I’m not sure I would’ve made it without my friend Pamela Benham Cooper who drove and then housed me in New Orleans. Outside Baton Rouge, traffic swelled and then stopped. Somehow, she found a back route to get us there. And her daughter Emmeline reserved us a table at Herbsaint, a restaurant you may want to put on your try-before-you-die list. 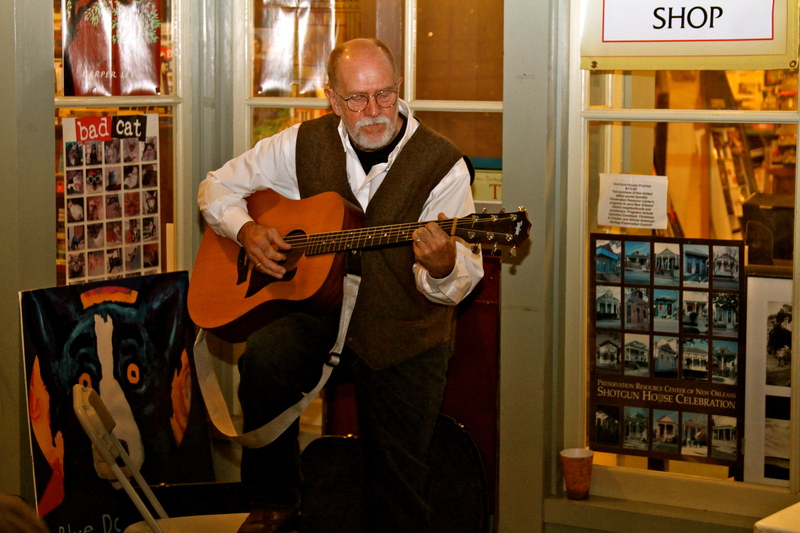 Thank you Pamela, Emmeline, Sonny, the wonderful people who showed up on such a cold night, Garden District Book Shop, and Heather Holland for taking so many great photos of our NOLA book event. Click on the first one to scroll through the rest. This entry was posted in Book Events and tagged Books. Bookmark the permalink. This sounds and looks like such an amazing event, Darrrelyn. I’m sorry I couldn’t have been there. Way cool, Darrelyn. Tom Piazza’s City of Refuge is one of my favorite novels, which we picked here at Otterbein as our Common Book last year. He came and gave an amazing series of lectures for our students. It’s good to see you are getting so much support from the literary community there. He’s the best, Richard. I met Tom years ago at Garden District Book Shop, and we’ve stayed in touch ever since. He’s one of my favorite writers, too. What a foot-stompin’, toe tappin’, hand wrappin’ event! Thanks for the inside glimpse into a wonderful evening. Those of us who have never yet planned one of these are taking notes. Shout out to Pam for the navigation and to all of you for creative planning and execution. Thanks, Shirley. We definitely kept the audience entertained. And I was entertained by the audience. Wish you could have been there. Those amazing pictures say a lot. To hear Sonny play “The Boxer” must have been a genuine treat. So proud of you both! Thanks, Dave. The fabulous Sonny Brewer not only played and sang well, he introduced us, asked questions, and helped entertain the crowd. He’s such a great friend. Now that rocks. (pun intended). 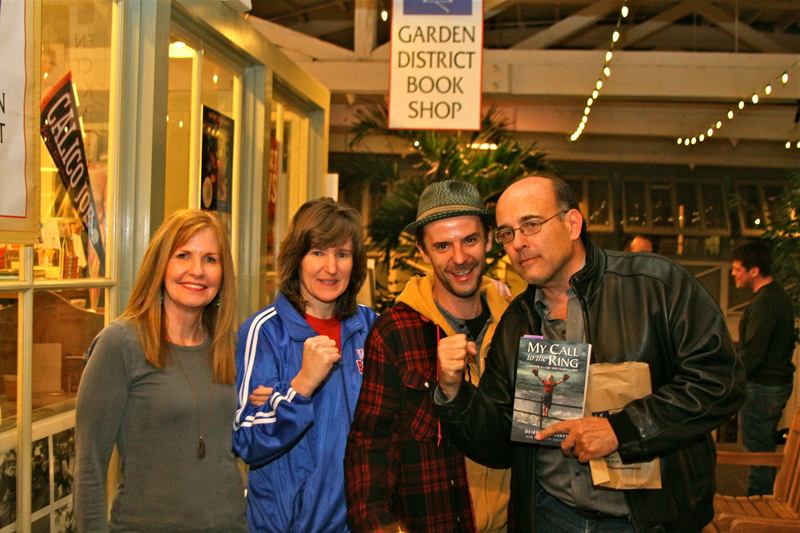 So glad to see the photos–I love the one of all four of you and the one with your son in the back holding your book! Wish I had made a fist in your favorite four-of-us pic. It never even occured to me until I saw the photo days after the event. And, of course, I’m partial to the one of my son in the background. Glad you love it, too. I got the guitar, and Dee got the bash. Good combination, I’d say. Thanks for stopping by, Roz. Love when visitors stop by from the UK. Ginger and I really, really wanted to attend, but it just would not work out. I’m so glad it was a great event. I understand, Herman. Would loved to have seen you though. We may be doing a book tour in your neck of the woods this summer. I’ll keep you posted. I would have loved to attend also!! It looked like great fun in freezing weather. 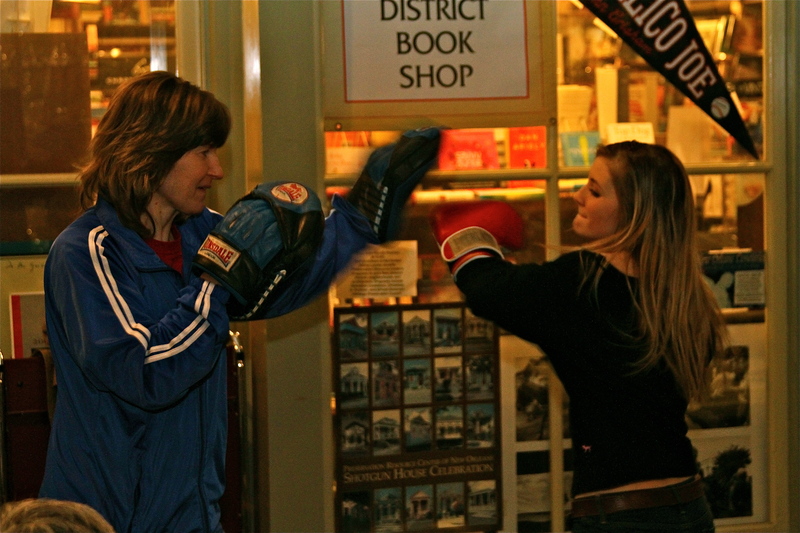 Wine, women, writing, boxing and song. I’d like to hire Sonny for my next party but will need to know what his rates are. Will follow up on that!! Congrats to you and Deirdre.